A recent addition to the Ayrshire Coast, Dundonald is fast becoming known as one of the best new courses in the British Isles. Designed by Kyle Phillips, who also developed Kingsbarns near St. Andrews, Dundonald evokes the thoroughly natural feeling of a classic seaside links course. Multiple tee boxes make it both a challenge and a treat for golfers of all skill levels. 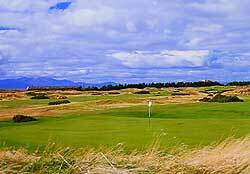 Dundonald’s light, sandy soil and moderate climate make the course suitable for year-round play.